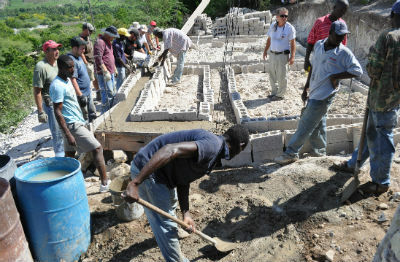 Photo: Rebuilding after the 2010 Haiti earthquake. The teams are not sent out only within the United States, but globally, as well. Throughout the years, Disaster Relief has sent teams to Haiti and Tanzania, as well as money to Japan, India, and Mexico. Many of these stories are published in articles at chognews.org, and share how much money was sent to each crisis. It is one of the simplest ways to share this information with donors and prayer warriors alike, and inspires them to bless others through the Disaster Relief fund. By raising funds, even when disaster is not imminent, Disaster Relief can immediately send teams and supplies to those in crisis. Church of God Ministries has reported on several disaster relief efforts over the years. One article in particular, published in September 2011, offers glimpse at the variety of disasters the Church of God was addressing at the time. Author Carl Stagner talks about the earthquake in Haiti, Hurricane Alex in Mexico, an earthquake and tsunami affecting Japan, an outbreak of 137 tornadoes in Alabama, and the devastating EF-5 tornado in Missouri. Over the past seven years alone, Church of God Disaster Relief has sent help for close to thirty different crises. They have sent resources as far as Japan and the DR Congo, and as close as Louisiana and South Carolina. Before resources could be packed, before teams were assembled on the ground by local churches and area assemblies, and before the first dollar was donated, someone somewhere had to have an idea. According to Pastor Donald Smith, former missionary and former director of Disaster Relief, the Disaster Relief Committee was formed in the 1990s. Unfortunately for him, there was not much time to get acquainted with the job before being thrown into action within the first week. 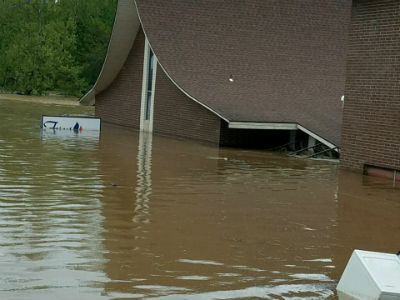 Photo: Recent flooding disaster at First Church of God, Doniphan, MO. The church responded in a significant way to the earthquake in Haiti. Disaster Relief raised $850,000 in response and in partnership with the Church of God across the United States and Canada. They were also able to fund an on-site coordinator to help over fifty-five work teams that went to Haiti, build seventy to eighty homes for Church of God families in Haiti, provide hunger relief, and help fund a new prosthesis unit at the clinic in St. Ard, operated by Dr. Mark Fulton. 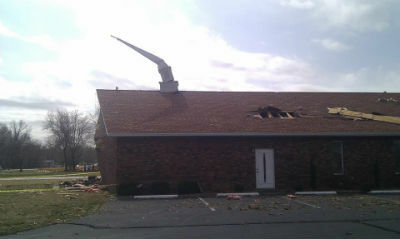 Photo: Tornado damage at First Church of God, Carrier Mills, IL, in 2012. This is just a small example of what Disaster Relief is and does. Disaster Relief continues to help in ongoing disaster relief situations, such as the present-day refugee crisis and the flooding devastation in Missouri. By reaching out and partnering with local volunteers and those around the world, Disaster Relief continues to make a difference for those who have been in crisis because of people like you. Your giving allows Church of God Disaster Relief to respond swiftly when disaster strikes. Give now at give.jesusisthesubject.org/disasterrelief. In crises where an immediate response is critical for relief, Church of God Ministries advances funds in anticipation of a gracious outpouring of donations from churches and individuals. Such advances are made from a limited Disaster Relief Fund maintained by Church of God Ministries for emergency response to disaster. One hundred percent of Disaster Relief contributions are utilized to bring relief to those affected by disasters worldwide. Christy Anderson is an Anderson University student and contributing writer to Church of God Ministries. This entry was posted in All Church of God, Disaster Relief and tagged Bob Edwards, Christy Anderson, Church of God Ministries, crises, crisis, Disaster Relief, Don Smith, DRC, earthquake, flooding, Global Strategy, hurricane, refugee crisis, tornado, tsunami. Bookmark the permalink.